Aikido is a martial art from Japan. It was started by Professor Morihei Usheiba(who is also called O Sensei, meaning “master teacher”). You will learn how to safely dodge (move out of the way of) an attack, and then control your attacker. The first step will take you to safety; the second step will let you keep yourself safe. The skills you learn in aikido classes will help you feel more confident. You might find the movements and techniques hard at first, but it won’t take long before they become much easier. At the beginning of class, all students bow to a picture of O Sensei. Next, we warm up to avoid injury and then practice some basic movement exercises. After that, we begin to work on techniques – first, your coach (or sensei, meaning “teacher”) will demonstrate with a partner, and then you will try the technique yourselves. Sometimes you will practice alone, but usually you will work with a partner or in a small group. Aikido doesn’t just use hand-to-hand techniques; we also learn to use weapons. The ones we use most often are the jo (stick), bokken (wooden practice sword), and tanto (wooden practice knife). It’s important to learn weapons work because it improves your sense of distance – and confidence! At the end of class, students bow to the coach, and again to O Sensei. Why is there so much bowing in Aikido? Bowing is a way of showing respect in eastern cultures like Japan, where aikido comes from. It’s a lot like shaking hands in western cultures. Each martial art has its own personality. In Aikido we blend and harmonise with attacks through circular movement. We practise traditional Aikido that is non-competitive. When you first start aikido classes, you won’t need anything special. You can just wear the same kinds of loose, comfortable clothes you would for any other sport. Later on, if you want, you can buy a gi – the white suit and belt you see used in all kinds of martial arts. Many martial arts have coloured belts, but not in our Association. We only have two belt colours, white and black – so you will start wearing a white belt. Students who wear white belts are called kyu grades. Those who have earned their black belts are called dan grades. You’ll notice that the dan grades are also wearing black “skirts” – those are actually very wide black trousers called hakama. Yes, we train with tanto (wooden knife), boken (wooden sword) and jo (wooden stick). Weapons work is an important part of Aikido because it helps to develop a sense of distance and confidence. The classes are always taught by one of our coaches, with at least one other adult there to help. Occasionally, some of the senior students will join the class to help students practice. Your classmates will be other junior students at all levels. It’s good to practice with as many different people as you can, so you get lots of experience. Sometimes, the coach will split the class into groups so that you can work on specific things, and other times you may even get to practice with a senior student! What do I do if I need to leave the mat? If you feel unwell or hurt yourself then tell one of the adults. Please do not leave the mat without letting us know as we want you to be safe. At the end of the class can I leave the dojo on my own? Normally you should wait in the room till you are picked up. Some juniors leave on their own but it depends on what your parents/carers have said on the Application/Registration Form. Unlike other martial arts, we do not have coloured belts, unless you are over 1st kyu grade where you achieve the black belt. Instead we work in kyu’s from 6 to 1 in the starting grades then goes from Dans 1 to 5. How can I find out more about Aikido? 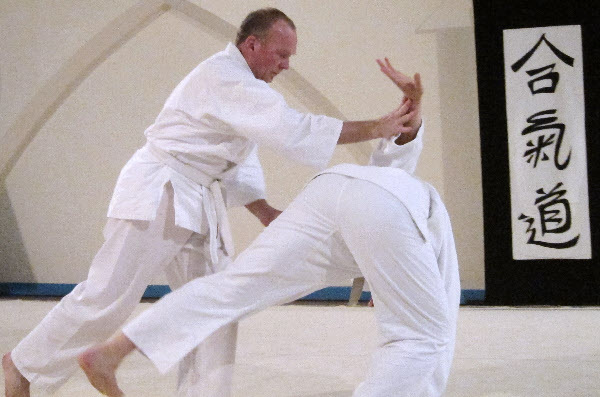 Why not start by taking a look at the Trafford Aikido website - that you are already on.